Nvidia’s GTX 670 arrives hot on the heels of the super-expensive, dual-GPU GTX 690. The 690’s rarified price--a cool grand, if you can find it--makes it of limited interest to most gamers. The GTX 670, on the other hand, offers performance as good or better than last year’s high-end GTX 580 while consuming much less power. At roughly $399, it’s still not a budget card, but it’s certainly affordable for users looking for a robust PC gaming experience on HD-resolution displays, but unwilling to shell out the $500 or more necessary for its high-end cousin, the GTX 680. Let’s take a quick look at the speeds and feeds for the GTX 670, and see just how it’s different from its pricier cousin. Note that clock frequencies are for the reference board. Shipping retail boards may differ in clock frequencies, depending on the design of the board and what the company shipping the board wants to support. The chip used in the GTX 670 is the exact same GK104 GPU as the higher-end GTX 680, but with one entire functional block--what Nvidia calls an “SMX”--disabled. The clock frequency is a little lower for the GPU core itself, but the memory clock frequency and quantity are identical. Those are the base specs in a nutshell. Now it’s time to check out how the reference board actually performs. Performance data was collected using FutureMark’s 3DMark 2011 and five DirectX 11 games: Crysis 2, Shogun 2: Total War, DiRT3, Metro 2033, and Batman: Arkham City. Also, system power under idle and load was measured using a Watts Up Pro power meter. The system used for testing consisted of an Intel Core i7 3960X running at 3.3GHz with 12GB of DDR3 RAM running at 1600MHz. Power supply, motherboard, and other hardware remained the same during the entire run, as did the operating system, Windows 7 Ultimate x64. Nvidia’s new $399 card easily bests last year’s high-end GTX 580 in 3DMark 2011, as well as both current high-end GPUs from AMD, the Radeon HD 7950 and Radeon HD 7970. 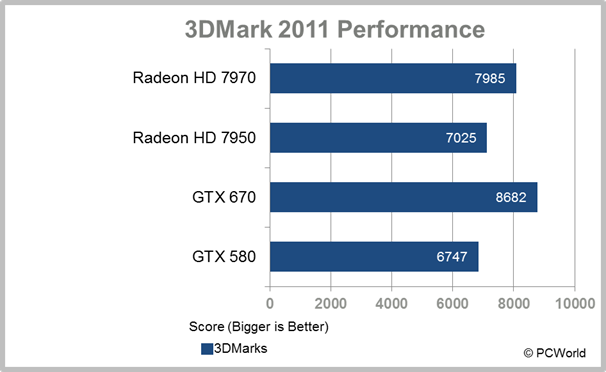 It’s worth noting that the GTX 670 easily beats last year’s model, as well as the similarly priced Radeon HD 7950. The average game performance is essentially a dead heat with the pricier Radeon HD 7970. It’s impressive how idle power has improved on all the current-generation cards. However, it’s also worth noting that the GTX 670 used here consumed just a little more power than a GTX 680 reference board. The actual difference was only a couple of watts, so it’s probably just variation in manufacturing. 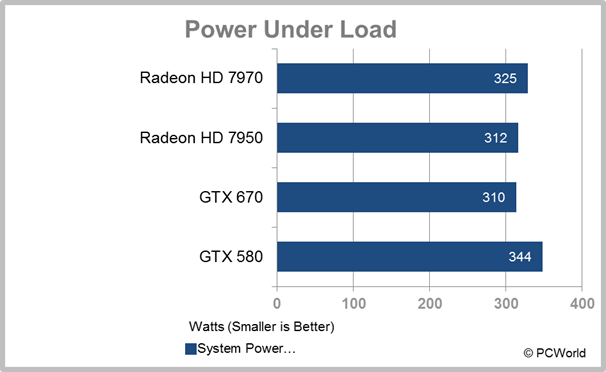 Under full load, measured when running 3DMark 2011 at very high resolutions and all features maxed out, the GTX 670 proves to be the most efficient card, though the Radeon HD 7950 is just a step behind. overclocking and other included features. The eVGA card, for example, will ship with a base clock of 967MHz, as well as pushing the memory clock to an impressive 1552MHz. Most companies building cards based on the GTX 670 will ship factory-overclocked versions. Some even take up more than two slots. Actual availability is an open question. The original GTX 680 has been difficult to find, with waiting lists for cards from most online retailers. It’s possible that GTX 670 cards will be built from GPU dies that weren’t able to pass full GTX 680 certification. If so, more of them should hit retail shelves. At $399, the GTX 670 is still aimed more at the subset of high-end gamers who are likely playing on a single, HD resolution display. At $100 less, you still get performance better than last year’s high-end GPU from Nvidia, and equaling more expensive cards based on AMD’s Radeon HD 7970. The card is surprisingly compact for its performance, and should fit in most midtower cases--even those lacking the depth to handle some higher-end cards. Power-supply requirements should be modest--a good 500W PSU should do the trick. If you’re a serious PC gamer thinking about upgrading, and already have a GTX 580 or similar high-end card, it’s probably not worth moving to a GTX 670. 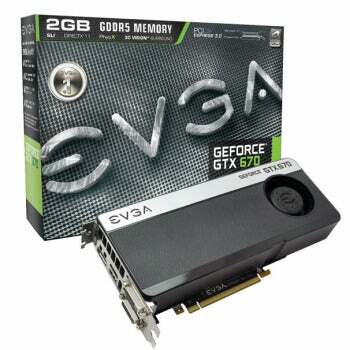 But if you have an older GTX 200 series or 400 series card, it may be well worth the investment. Nvidia's latest GPU equals the performance of its high-end predecessor, the GTX 580, with a less rarified price. It's almost as quiet and power-efficient as a GTX 680, too.